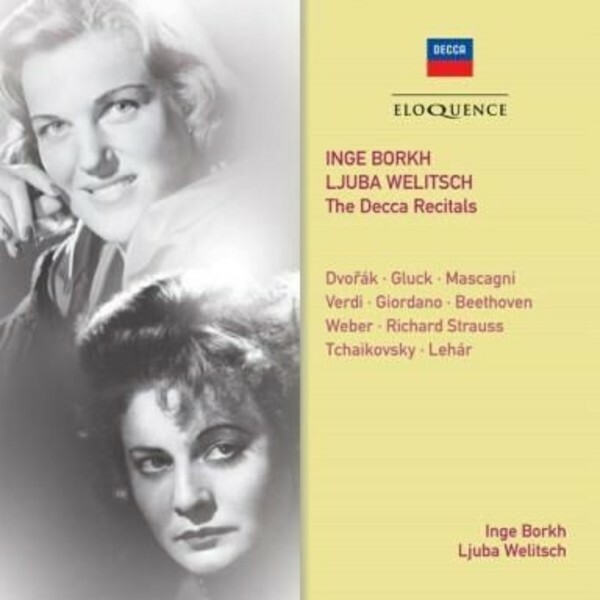 These recordings of the voices of Inge Borkh and Ljuba Welitsch are very fine examples of the art of the dramatic soprano from the 1950s and early 1960s. Borkh acquired a considerable reputation as Aida, Tosca, Turandot, and Medea in Cherubini's opera of the same name, as well as Leonora in Fidelio. On this anthology, bringing together her recital records for Decca, we are given two mixed recitals and one of three great operatic scenes (Beethoven, Strauss, Weber). Bulgarian-born Ljuba Welitsch liked to sing and play the violin as a child. She studied Philosophy at Sofia University and began to train her voice at the Sofia Conservatory and then in Vienna at the Music Academy. It was in Vienna that her performance as the Composer in Ariadne auf Naxos attracted the attention of Richard Strauss who suggested that she sing Salome. Her first Salome was in 1944 at a performance conducted by the composer himself to mark his 80th birthday. By the mid-1950s Welitsch had begun to switch to smaller roles and comic parts, after having driven her voice mercilessly and undergoing a throat operation. Her only recital disc for Decca (and one of her very few studio recordings) was recorded in Vienna in 1950. By way of a 'bonus' we have Rudolf Sieczyski's nostalgic song 'Wien, Wien, nur du allein', composed in 1913 and performed here in a 1960 recording of Die Fledermaus as part of a 'gala' featuring a host of famous singers at Prince Orlofsky's ball. Welitsch had been coaxed out of retirement to take part in this bit of fun (which was not without precedent in Vienna) and her contribution is very moving.